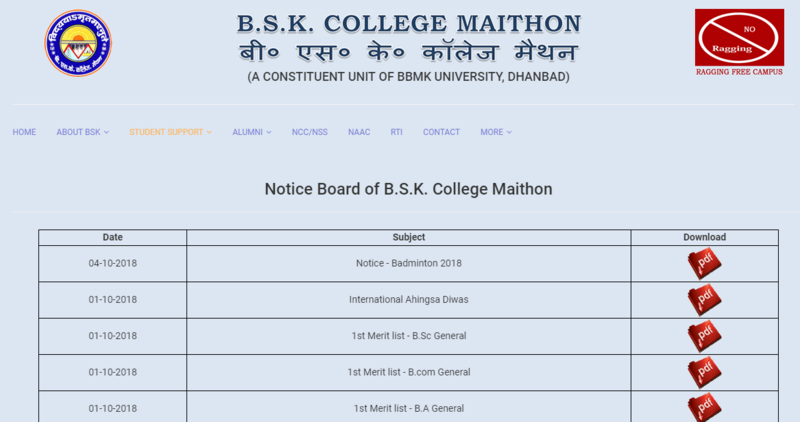 BSK College Merit List 2018-2019, BBMK University, Maithon, Dhanbad News – Officially, BSK College Merit List has been released online separately as 1st Merit List and 2nd Merit List. After that, the official website of BSK College i.e. www.bskc.in/notice.php has received a number of updates like International Ahingsa Diwas and Notice regarding Badminton 2018. 1st Merit List of complete BSK College was released separately for Bachelor of Science General, Bachelor of Commerce General and Bachelor of Arts General on 1st October 2018 (all three subjects different merit list was published on the same day that is 01.10.2018). Each and every Merit List of BSK College, Maithon includes the course name, Admission year like – UG Admission (2018-2021), Name, Father’s Name, Date of Birth, Gender, Below Poverty Line or BPL or NOT, subject 1, subject 2 and subject 3, AECC, Aggregate Marks, Sign in this Column if application is approved, sign in this column if application is rejected, remark/ reason for rejection, Sign of Uploader on Chancellor Portal (with date) and other details. The 2nd Merit List was very first published under the notice section of the authorised portal on 18th September 2018 as 2nd Merit List for Physics, for Zoology, for Maths, for English, for History, for Geography, for Political Science, for Urdu, for Economics, for Hindi, for Bengali. Then, on 19th September 2018, a separate Notice was also published. On 20th September 2018, Notice for Admit was released. Then again, last 2nd Merit List was published on 24th September for Commerce.